The ESEM consists of five main components and numerous accessories. (1) The main console rack houses the electron optical column and specimen chamber. A high-tension electric cable is attached to the top of the electron optical column. The high-tension power supply, in the lower part of the console rack, has inlet and outlet ports for cooling water. An evacuation port attaches the specimen chamber to the two (2 and 3) rotary vacuum pumps. (4) The display and operation system houses the electronic controls for the electron beam, detection devices and imaging systems, such as cathode ray tube viewing screen, and a Polaroid camera to photograph the television image. (5) A power supply box provides stabilised power to the display and operation system. Accessories include metal and plastic specimen holders that allow a specimen to be viewed under environmentally controlled conditions while it is in the path of the electron beam. 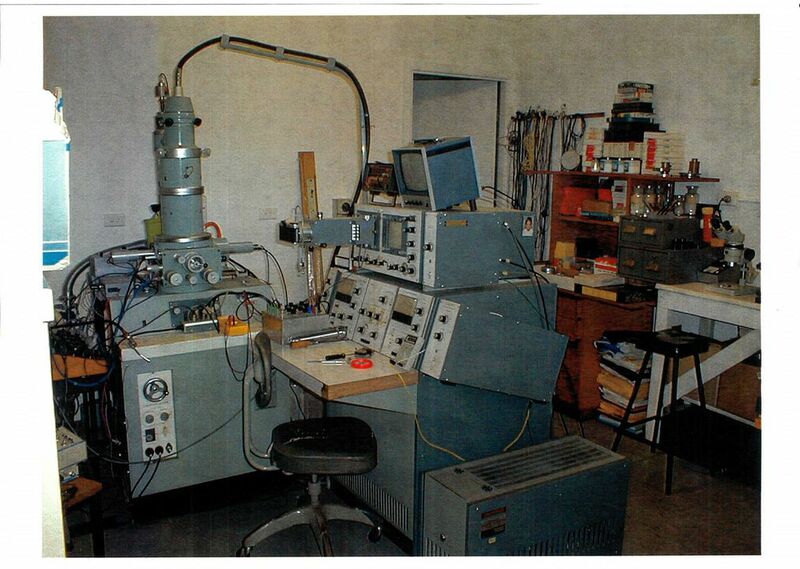 This unit, originally a JEOL JSM-2 scanning electron microscope, owned by UNSW, was transferred to CSIRO Wool Research Division, already converted to ESEM mode by Dr. Gerry Danilatos, who then brought it to a state-of-the art prototype just prior to its commercialisation. Commercial prototype models (ElectroScan) based on Danilatos's environmental scanning electron microscope (ESEM) patents derived from this unit, first appeared in 1988. Philips Electronics North America Corporation purchased ElectroScan (11/07/1996) to form Philips Electroscan, which changed to FEI Company (21/02/1997) on merging Philips ElectroScan with FEI. There are now thousands of ESEMs in use world-wide; no research body dealing in biological or environmental mode studies can do without a ESEM. The initial development of the environmental scanning electron microscope (ESEM) took place at the University of New South Wales (UNSW) in the late 1970s; however, support for the program that Danilatos was charting out of his early findings was not adequate. The instrument had to make room for another project and vacate the grounds of the UNSW. With the financial support of the Australian Wool Corporation, the entire activity was transferred to the Textile Physics Division of CSIRO from 1983 to 1986. Even there, ESEM did not develop to its full potential and, once more, Danilatos and his equipment had to leave. At the same time the ElectroScan Corporation had just formed in the USA to manufacture exactly what Danilatos had been working on for all the previous years since 1978. With financial support from the USA, together with all the equipment released by CSIRO to Danilatos on an indefinite loan, the ESEM Research Laboratory was established at North Bondi, NSW, Australia. Due to another relocation the bulky Prototype ESEM could not be maintained beyond 2002 and Danilatos sought to donate it to the Powerhouse Museum for preservation and possible display, after having worked with it for twenty-four solid years.